KESO Omega 8000Ω² is the latest generation of mechanical and mechatronic locking systems with new active copy protection. The reversible key system is suitable for both complex and simple locking systems. With a patent valid until 2034 and functional design protection, the new KESO system offers you extremely long investment protection. The system is rounded off with an innovative modular system for problem-free extension or shortening of the cylinders on-site. Consistent protection of a property is guaranteed if keys and cylinders are both patented and certified. KESO 8000Ω² profile cylinders comply with the DIN EN 18252 standard and are certified according to DIN EN 1303*, VdS** and FZG. All cylinders fulfil the highest requirements for operation, corrosion and locking security. In the standard version, KESO 8000Ω² is tested in accordance with DIN EN 1303 resistance class D or VdS A. On request, we can offer even higher protection against drilling open and pulling with VdS – to fulfil your requirements optimally. A patent alone does not offer protection from illegal key copies, regardless of whether copying takes place by conventional means or via 3-D printing. To prevent illegal key copies, you need active copy protection in the form of a moving element on the key. With KESO 8000Ω², you benefit from a modular system that is not only quick to install but can also be extended flexibly. The length of the cylinders can be adapted on site to fit almost all door thicknesses. Different cylinder types can also be integrated into one locking system – from profile cylinders and locking cylinders to padlocks. This provides comprehensive system solutions that can be implemented easily and expanded as required. The benefit for you: lower investment and maintenance costs. 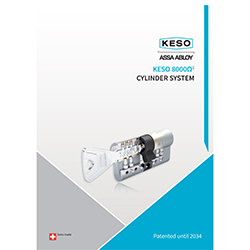 A big bunch of keys is a thing of the past with KESO 8000Ω²: just one key is required to operate multiple cylinders. The KESO principles observe strict compatibility rules based on a unique idea: "The key to your world." From the turn key to electronically controlled master key systems, all areas can be controlled and managed with a single online or offline software management system and key. KESO 8000Ω² locking systems are compatible with mechatronic and electronic components of the KESO-Integra platform. Third-party systems, such as time management, can also be operated via a 2nd RFID transponder in the key. KESO systems offer a wide variety of locking options to fit all needs, ranging from mechanical cylinders in a to cylinders that incorporate both mechanical and electronic components, to systems that operate through electronic components only. All that can be used together using the same KEK Combi Key. 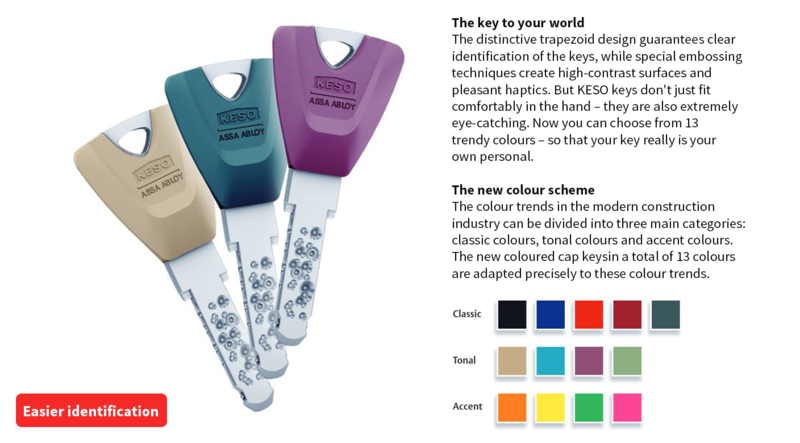 Available metal only or with caps for easier identification, the Keso key combines security and design. Please download brochure in PDF format.